First of, before you’re able to download the plugin – you are asked to create a Disqus account. I figured, an account may merely be for marketing purposes, but right after creating one – you are presented with a API key. Now something tells me that this system is something more – I was right. Disqus is able to provide the system to any type of blogging platform you are using: Typepad, Movable Type, Blogger and WordPress. Note that there is also “Generic” which I assume is for static websites. Now remember I said what I was expecting to see check boxes for Facebook and Twitter? Well that’s what I got. Plus options that span from the ability to display Social Media Reactions (replies or social media services like Twitter, FriendFeed, Digg and YouTube), Trackbacks (we all know what this is), Seesmic video comments, OpenID and of course – Facebook connect and Twitter. Now as if that’s not “mashed-up” enough – there is also an option to add a Disqus Feedflare to your Feedburner. A FeedFlare places a simple footer at the bottom of each content item, helping you to distribute, inform and create a community around your content. Where Are the Actual Comments Stored? Now the funny thing is once you’ve installed Disqus in your WordPress blog – it takes over your commenting system. Try clicking “Comments” from your WordPress admin panel and it will take you to the Disqus settings screen (which is just an iframe of your Disqus account). From this interface gives you total control of your blog comments such as importing existing ones to Disqus, moderation, as well as adding widgets and changing the look of the form. Did I say “Import existing ones“? Yes I totally did. As it turns out, once you have Disqus installed – it uses it’s own database to store your comments in their system. A system that still ties with your website and post id. Now don’t fret! Your wp_comments table (where your comments are stored in WordPress) remains untouched. Furthermore, it is updated at the same time new comments are entered, with the Disqus system. Okay, with Disqus you can mash up world renowned applications with your comments. You can add widgets, change the appearance, move things around in your comments section with a few simple clicks. You can manage your comments in both places: your website control panel and your online Disqus account (since the comments are literally stored in two databases). All of this are wonderful features but there has to be a kicker. A “kicker” as in a feature so significant, that blog owners will actually deviate from their regular commenting system and use Disqus instead. For starters, now you can moderate comments centrally in one place. Really, I’m sure many of us run more than one blog. For the lucky ones that are bombarded with hundreds of comments daily, this is definitely a kicker. Another one is the ability to add moderators. That’s correct, with Disqus – you now can add comment moderators (similar to a forum) without giving them access to your physical blog. This is a big plus for sites with a large enough community. What about the ability to “Reblog“. Reblogging is exactly like “Retweeting” – but it’s a post instead of a tweet. How about having a “Lifestream” type of your blog posts in the Disqus website. Once you join Disqus – you automatically get a community page (http://yourwebsitename.disqus.com) that displays quick feeds of your latest posts – that link directly to your website. I’m sure there are other “kickers” for the Disqus system that I haven’t discovered yet. Consider that I’ve only been using it for a mere five hours! But there could also be downfalls. For instance, I now don’t have any code control of my comments section. 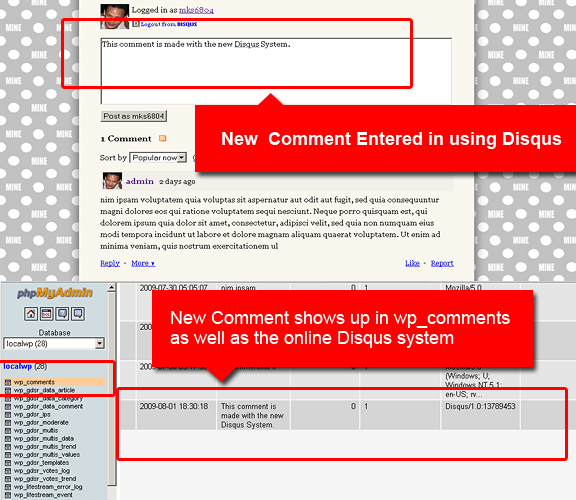 Once Disqus is installed – the comments.php in your WordPress theme is completely overridden. Another point to ponder: since your data is now in two places – isn’t it kind of scary? By this I mean, back ups, redundancy, duplicate data, “what if disqus.com is down – what will happen?” – am I just paranoid? Overall, I think the Disqus Comments system is a sophisticated platform that is sure to enhance your blogs discussion abilities. It is simple enough to use, safe, and at the same time – provides enough bells, whistles and “kickers” that blog owners will sure go for. I know when I see “Comment with Facebook Connect” – it makes me want to leave a comment more; therefore, it works for your readers as well. What about you? What’s your take on a third party comment system such as Disqus? WordPress should be ashamed at how much unnecessary maintenance its users must endure amid comments, with or without the paltry Akismet bolt-on. Disqus earns its place in the plugin list by making it easier for end users to comment while at the same time protecting bloggers from drudgery and spam. Unfortunately Disqus is so new there are still teething troubles. I had to shut it off because it spews a visible code dump into my Featured Posts gallery on home. Anyone found a fix for that? I thought this was a definitely interesting post it gives me some better ideas for commenting using WordPress. Thanks for sharing nice information. I enjoyed your blog so much. Anyway, great Flyers Design. I like the second one most. Thanks for these beautiful inspiration. I’ve actually not used the Disqus commenting setting on any of my blogs yet. With regards to system redundancy, could you just to a temp block on the Disqus server IP in .htaccess on your site? That way you could test the fallover situation. I don’t think this would do any harm and it would be very easy to undo. It has been used to increase comments and the community spirit for the blogs that have installed it. i really aprreciate the way you high light some of the most important facts and figure on Commenting System with WordPress..cheap textbooks is also following 2.0 standards.. i have used all the standards which i knew may be it is lacking some thing… can anyone suggest me what should i do to improve it more.. I love the Disqus comment plugin for WordPress, I only wish they would build in a config to make comment links dofollow (instead of default nofollow). It’s fantastic other than that. I love Disqus, its great for managing comments. I am currently having a play with the system myself but haven’t had enough time to carry out a proper investigation – I did make the system live on a client’s site and it gave me a white screen of death! I am sure this was to do with a plugin conflict etc so I will be watching this post closely to see if I should dig a little deeper into it.